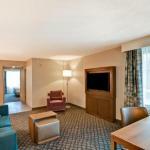 Good solid embassy suites with comfortable rooms for a reasonable price. The free breakfast is a plus. I was amazed at how friendly the staff was. Room bedroom was on street - to much street noise. The 167 all-suites Embassy Suites Hotel Orlando-Downtown is located in Orlandos central business district and provides high quality accommodation for both the upmarket business and pleasure traveler. Items included with the room rate at this full-service hotel are a cooked to order breakfast, a nightly managers reception with snacks and cocktails, high-speed Internet access, local telephone calls and a morning newspaper. There are 12 rooms available for business or social functions. The largest can accommodate 600 guests. Area attractions and landmarks and attractions include the Mennello Museum of American Art, the Harry P. Leu Gardens, the Orange County History Center, the Orlando Ballet, Florida Citrus Bowl and Amway Arena, home of the Orlando Magic basketball team. The two-room suites come with a choice of one king size bed or two double beds. There is a sitting area with a sofa, television with cable news and movie channels, pay-per-view movies, work desk with high-speed Internet access, alarm clock radio, kitchenette with refrigerator and coffeemaker, two two-line telephones with voicemail and speakerphone, iron and ironing board and a hairdryer. This hotel has an outdoor swimming pool and a fitness room. There is a coin-operated laundry, ATM, gift shop and a business center. The 24-hour front desk has safe deposit boxes and information on area events and attractions. The hotels Eola Café serves, breakfast, lunch and dinner and room service is available throughout the day. Places to eat nearby include Tijuana Flats, Ichiban, Cafe Trastevere, Panera Bread, Shari Sushi and the Kres Chophouse. Many travelers rate this as the best place to stay in downtown Orlando. The location is ideal, within walking distance of shops and restaurants, and the employees here do a splendid job insuring that everyone has an enjoyable stay. The suites are squeaky clean and well equipped. The complimentary breakfast and evening reception were much appreciated. Most clients say they will recommend this hotel to others and plan to stay here on future visits to Central Florida. Parking: Yes, there is parking. Valet parking costs $18 per day.